A new take on this most notorious of true spy stories, A Spy Among Friends: Kim Philby and the Great Betrayal, captures not only Philby’s concurrent work for MI6 and the KGB, but also examines the trail of broken lives he left in his wake. Using interviews and archival materials, journalist Ben McIntyre has crafted a gripping account of how and why an upper-class Englishman cold-bloodedly sent scores of Western agents across the Iron Curtain to their doom, brought misery and ruin to his several spouses, and destroyed the careers of his colleagues and intimate friends. Philby was a traitor with a cause; he spied not for money or the rush, but because he sincerely believed in building the radiant future promised by Communism. 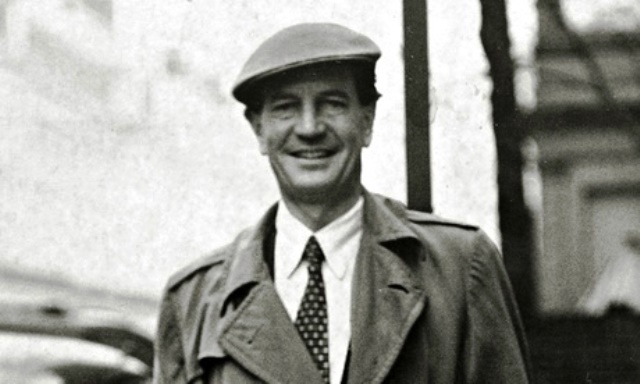 From 1934, when as a fresh-faced graduate of Cambridge’s Trinity College he was recruited by Soviet intelligence, until his dramatic Beirut defection in 1963, Philby kept an unyielding inner faith in his mission, a conviction he maintained until his death. Kim Philby in Washington, D.C., during his time as MI6 liaison. Philby’s youthful conversion to Marxism was hardly extraordinary – across interwar Europe, Communist ideology was en vogue amongst intellectuals, and the Soviet Union seen as a promising experiment in the creation of a new society. Indeed, another four of Philby’s classmates would also pledge their loyalty to Moscow Center, forming the Cambridge Five, an agent network that even today is celebrated by Russia’s successor foreign intelligence service to the KGB, the SVR, as a classic long-term penetration. The immediate cause for Western educated classes’ draw to Marxism could be found in the severe economic crisis that first struck Britain, America, and the Continent at the dawn of the 1930s, with accompanying impoverishment, political instability, and the rise of fascism. While the privileged Philby and his friends were not directly affected by the depression, intellectual fashion held dialectical materialism and revolutionary state socialism as the answer to a capitalist civilization that had failed. Liberal democracy had already revealed itself a fraud as rapacious oligarchs expanded holdings proportionate to the misery of ordinary workers. Hardly some alien system of thought that arose on the Eurasian steppe, the totalitarian temptation was borne from the governing philosophies of the modern West. Born in Lahore and named after the hero of Rudyard Kipling’s novel of the Great Game, Kim Philby was a child of the British Empire. And thousands of miles from the Punjab, London ran a global enterprise founded upon Lockean classical liberalism, scientific-industrial might, and the maritime-commercial tradition of Carthage, Athens, and Venice. Philby’s largely absent father, St. John Philby, had made his career as a highly regarded orientalist in the mold of Lawrence of Arabia and would serve as an “advisor” to King Ibn Saud. The younger Philby received a classical education, his upbringing largely shaped within the most prestigious public schools. Though “God, King, and Country” may have been the credo of service for the Empire’s administrative elite, few if any of these men actually believed in God the way their ancestors did, while king and country became mere rhetorical cover for the designs of predatory banking dynasties. Rather, as Philby’s best friend and fellow MI6 officer Nicholas Elliott declared, they served “king, country, class, and club,” hardly a formula for inspiration. The Liberal, the worldly man, is the man who has lost his faith; and the loss of perfect faith is the beginning of the end of the order erected upon that faith. Those who seek to preserve the prestige of truth without believing in it offer the most potent weapon to all their enemies; a merely metaphorical faith is suicidal. The radical attacks the Liberal doctrine at every point, and the veil of rhetoric is no protection against the strong thrust of his sharp blade. The Liberal, under this persistent attack, gives way on point after point, forced to admit the truth of the charges against him without being able to counter this negative, critical truth with any positive truth of his own; until, after a long and usually gradual transition, of a sudden he awakens to discover that the Old Order, undefended and seemingly indefensible, has been overthrown, and that a new, more “realistic”–and more brutal-truth has taken the field. The age of chivalry is gone. – That of sophisters, economists, and calculators, has succeeded; and the glory of Europe is extinguished forever. That Philby and Anthony Blunt, another of the Cambridge Five and Surveyor of the King’s Pictures, were knighted before their treachery was exposed by MI5 is forgivable, but they themselves were symptoms of a deeper affliction. Chivalry in our age, like every other worthy value, has been systematically subjected to the logic of inversion. How else do we explain noble titles granted to the masters of usury, purveyors of anti-culture, and dissolute rock stars? And what of “Sir” Jimmy Savile, BBC disc jockey and famous confidante to the Royal Family, who for decades perpetrated rapes against countless children throughout Britain, or the several dozens of MPs and government officials who are only now being implicated in organized pedophilia and child murder rings? Far beyond spying, wickedness of this sort bears directly the stamp of the satanic; would that God awaken Arthur and his knights to sweep away such filth from England’s green and pleasant land. Cold warrior to the end, Philby staked out his own duplicitous role in the bipolar confrontation between capitalism and communism. Yet largely unbeknownst to the rank-and-file soldiers of either side, the planned outcome of this dialectical clash was universal tyranny. Just as the Marxists appealed to the inevitability of history, so the plutocratic Western superclass – quite openly through theoreticians from H.G. Wells and Aldous Huxley to Bertrand Russell and Zbigniew Brzezinski – have trumpeted the supremacy of “science” to justify their will to total power. The technocratic World State, a madman’s dream threatening transmutation into our reality, would make the Soviet project seem as childish play-acting in comparison. Kim Philby was doubtless a traitor; levels above him, criminals far more grandiose have been engineering the annihilation of the family, national and religious heritage, and the very essence of human identity. Herein lies the greatest betrayal. Illustrated. 368 pp. Crown Publishers. Reblogged this on The dye is cast! !.